Winter sports enthusiasts likely enjoyed the snowiest February on record more than those attempting to buy and sell homes. Even so, the latest numbers for Twin Cities residential real estate show some strength amidst ongoing signs of change. 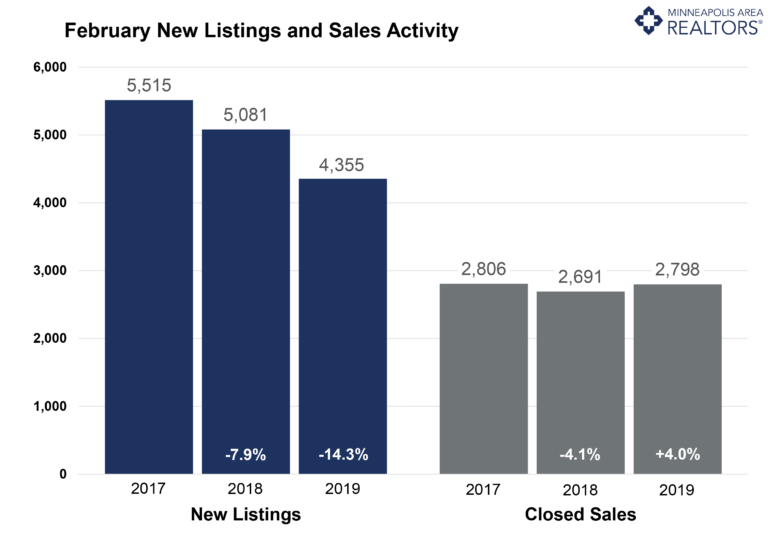 Sellers showed a sizeable, weather-related decline in listing activity, while buyers entered into fewer contracts than last February even while closed sales rose. Market times flattened out as the median sales price continued to rise compared to last year. One sign of a changing market is the fact that the ratio of sold to list price has fallen for three of the last four months. This—along with other indicators—suggest the market is improving for buyers, even though sellers still have strong pricing, favorable negotiating leverage and quick market times. Due to the decline in new listings, the number of active listings for sale decreased compared to the prior year. Even so, buyers have seen inventory gains for four of the last five months. Months supply followed suit, tick down to 1.6 months, suggesting the market is still tight. Buyers should expect competition on the most sought-after listings and neighborhoods. After increasing to 5.0 percent in November, mortgage rates have settled back down around 4.5 percent. That’s great news for buyers. The supply squeeze is most evident at the entry-level prices, where multiple offers and homes selling for over list price are commonplace. The move-up and upper-bracket segments are less competitive and better supplied. Inventory could rise substantially, and we’d still have a balanced market.